Item2006.20.12.40 - Military Plane Called "39"
The Royal Canadian Air Force (RCAF) was the air force of Canada from 1924 until 1968 when the three branches of the Canadian military were merged into the Canadian Forces. The modern Canadian air force has been known as Canadian Forces Air Command (AIRCOM) since 1975, but still refers to itself as the "Air Force" and maintains many of the traditions of the RCAF. Handwritten photo album caption below this photo reads: "The above ship, after 'doing' a barrel-roll 50 feet above the runway." 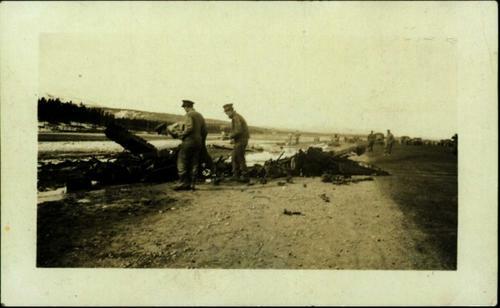 Photograph depicts three men in uniform bent over wreckage of plane crash in airstrip believed to be at Whitehorse, YT. Large group of men and vehicles in background on right, trees and hillside in background on left. Stamped annotation in blue ink on recto of photograph: "130". Item originally located within a makeshift photo album with no front or back cover, measuring 25.5 x 33.3 cm and bound by a brown shoe lace strung through two holes punched along the left side of the album and tied in a bow. A straight bend extending the width of each of the 12 pages next to their holes suggests that at one time these pages were housed within an album cover. Photograph is attached to its page by insertion into four photo corners; photo corners are glued to the page, however the photograph is not.